This week marked the 46th anniversary of the landmark US Supreme Court decision Roe v Wade which determined that the American Constitution’s protection of privacy rights included allowing States to lawfully permit abortion up to viability. The newly permitted “right to abortion” varied according to which trimester a pregnancy had reached. In the five years preceding Roe v Wade, one of the main proponents of abortion was Dr Bernard Nathanson. He was an obstetrician and gynaecologist and had become increasingly involved in campaigning for NARAL (National Association for Repeal of Abortion Laws, later the National Abortion and Reproduction Rights Action League). “ The manipulation of the media was crucial , but easy with clever public relations , especially a steady drumfire of press releases disclosing the dubious results of surveys and polls that were in effect self-fulfilling prophecies, proclaiming that the American people already did believe what they soon would believe: that all reasonable folk knew that abortion laws had to be liberalized….Of course the time was ripe”  Ibid, p 88. Yes, unfortunately, the time was indeed ripe for change by 1973. The campaigners had reached their destination, and “reasonable folk” included the majority of the Supreme Court. Any vestige of the inalienability of the human right to life which had so carefully been placed in the UN Declaration on Human Rights in 1948 was quickly being whittled away by the newly-crafted superior rights such as privacy; personal autonomy (however scientifically flawed) and reproductive rights. Yet it is a conveniently overlooked fact that by the time Roe v Wade was heard, the plaintiff Norma McCorvey had already given birth to her baby. Moreover in the aftermath of Roe v Wade and once abortions became readily available, Dr Nathanson began to have increased doubts over abortion. Ultimately both he and Ms McCorvey became vocal campaigners for the rights of the unborn child, realising that the “prize” of inalienable rights for women over “their own bodies”, disregarded entirely the rights of the baby. Both of them also became converts to Catholicism. Since Roe v Wade there have been over 60 million lawful abortions in America. Black babies are disproportionately represented in these figures. There are signs, however that the current generation of Americans are waking up to the horror of these numbers. They realise that there are gaps in there own families which will never be replaced. Many of them head to Washington’s annual March for Life which has takes place every year around the anniversary of Roe v Wade. 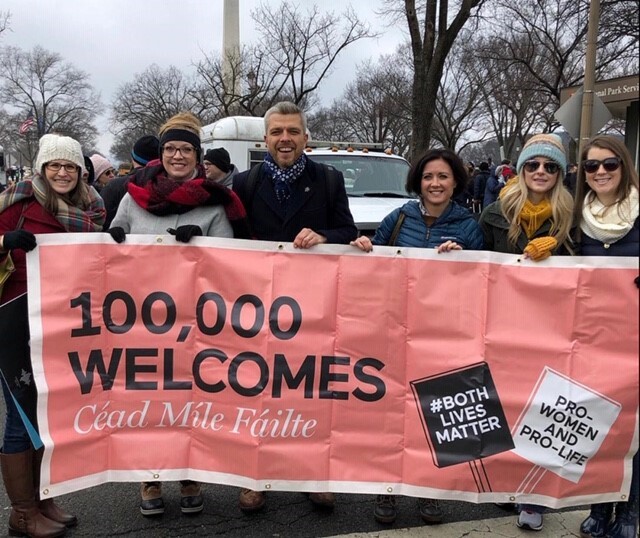 This year Dawn McAvoy and Peter Lynas of Both Lives Matter were there for the 46th March for Life, along with hundreds of thousands of others at one of Washington’s biggest annual events. It is right to remember the millions of lost lives on this inauspicious anniversary. It is important to do everything possible to halt the terrible tide of abortion which destroys babies’ lives and damages mothers and their families afterwards in so many invisible and visible ways. Over the last five years we in Ireland and the UK have had many centenaries to recall and commemorate including the beginning and end of the devastation caused by the First World War. Only this week the centenary of the sitting of the First Dail has been remembered. It is ironic that exactly 100 years later, the current Dail has just implemented some of the most liberal abortion laws in Europe. We in Northern Ireland are faced with repeated attempts to liberalise our law in keeping with the supposed “progress” achieved so recently by our nearest neighbour. I was born in 1964. It will be 46 more years until the centenary of Roe v Wade will be remembered. I hope and pray that the increasing distaste of the American public for the scourge of abortion which has denied so many their children; siblings; grandchildren and future generations, will be in sharp reverse by 2073 and that a renewed appreciation for life at every stage will emerge. It may take decades to get to the point of the public accepting the terrible damage which Roe v Wade brought to American society. But I believe “the time is ripe” now to overturn that damage, so that the centenary of Roe v Wade will be a celebration of its reversal. We in Northern Ireland should take heed of the damage done in the US; Great Britain and now sadly in the Republic of Ireland before hurtling down the same sad route. It is not too late to appreciate that Both Lives Matter and that there is always a better way than abortion. With thanks from all of us at Both Lives Matter to our guest author Mary Lewis BL (LLB, and LLM in Human Rights and Discrimination). Mary is currently studying for a Masters in Theology at the School of Annunciation in Devon. She is a former Chair of Life NI and member of Iona Institute NI. The views and opinions expressed, are those of the author and do not necessarily reflect the official policy or position of Both Lives Matter.